The Joint UAE-Egypt Economic Committee discusseed opportunities, challenges and the potential prospects of cooperation in several vital sectors between the countries during a meeting in Cairo, Egypt, recently. The meeting was held in in the presence of Eng Sultan bin Saeed Al Mansoori, UAE Minister of Economy, and Tariq Qabeel, Egypt Minister of Trade and Industry, said a statement. The two countries reviewed opportunities in 13 vital sectors including trade, customs, industry, technology, tourism, financial cooperation, standards and metrology, electricity, renewable energy, transportation, aviation and water resources, it said. The discussions highlighted the strength of the bilateral ties and a common desire to boost it further. It was decided to hold the joint committee meeting as an annual event, it added. The two sides also discussed the Greater Arab Free Trade Agreement and ways to activate the joint UAE-Egyptian businessmen council. The committee also discussed cooperation in the finance and taxation sectors, as well as possibilities of cooperation in the field of Halal products. The forum stressed the need to enhance customs cooperation and promote the volume of investments exchange and cooperation in the aviation sector, while strengthening cooperation in water resources management, sustainability and transportation, particularly shipping and ports. They also discussed cooperation in electricity and renewable energy sectors, said a statement. The meeting was attended by Juma Mubarak Al Junaibi, UAE Ambassador to Egypt; Eng Mohammed bin Abdul Aziz Al Shehhi, undersecretary of Economic Affairs in the Ministry of Economy; Mohammed Saleh Shalwah, advisor to the Minister of Economy for the Arab League and the GCC Affairs; and Jamal Saif Al Jarwan, secretary-general of the UAE International Investors Council. The UAE delegation included Dr Matar Al Nayadi, UAE undersecretary of the Energy and Industry; Hameed Mohammed bin Salem, secretary-general of the Federation of UAE Chambers of Commerce and Industry; Abdullah Abdulkader Al-Ma'ini, general director of Emirates Authority for standardisation and Metrology (ESMA); and Ibrahim Obaid Al Zaabi, UAE Insurance Authority (IA), as well as representatives from government and private sector organisations. This forum was preceded by a preparatory meeting of industry experts and senior officials. 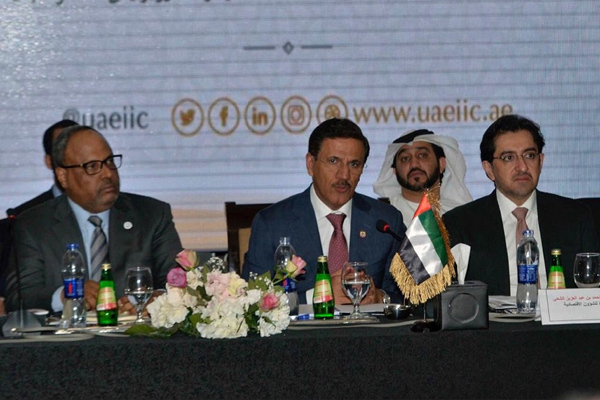 The UAE side was headed by Eng Mohammed bin Abdul Aziz Al Shehhi, and the Egyptian side was headed by Saeed Abdullah, first undersecretary of the Ministry of Commerce and Industry for the Commercial agreements sector. The two sides also held a roundtable meeting, the first of its kind for the chief executive and investors from UAE and Egypt, organised by UAE International Investors Council and the Federation of Egyptian Chambers of Commerce, with the participation of more than 40 major investors, businessmen, leaders from sectors like renewable energy, agriculture, aviation, Information Technology, telecommunications, tourism and hospitality. He added that the UAE and Egypt enjoy a prefect strategic relationship based on political, economic, social and cultural ties, and affirmed the need to unite for the common prosperity and sustainable development of both nations. Al Mansoori said that Egypt is a strategic trade partner of the UAE in the region, and the UAE is the Egypt’s top 10 trade partner worldwide. The total volume of non-oil trade exchange between the both countries recorded about $3.6 billion in the first nine months of 2017 and touched around $4.8 billion at the end of 2016, growing by 11 per cent from the previous year. The official added that the UAE recorded total direct investments about $6.5 billion, covering strategic economic fields such as telecommunications, tourism, financial and banking sectors, real state, infrastructure and ports, as well as agriculture, trade, food and medicine, and all the sectors vital to sustainable development. He reviewed the opportunities and possibilities offered by the UAE economy in light of its policy of economic diversification and pioneering development policies, and pointed out that in terms of investments, the UAE is the at forefront of Arab nations in terms of the volume of foreign direct investment flow. He also took stock of the country’s efforts to build and promote its capabilities in innovation and consolidating its contribution to the development process. “The current environment is fully conducive to the transition to a new phase of cooperation and partnership between the brotherly countries, realizing our future aspirations for prosperity,” he added. Qabeel said that the Joint Economic Committee supports mutual efforts to develop economic and trade relations to more advanced levels and commended the strength of relations between the two sides in various fields.